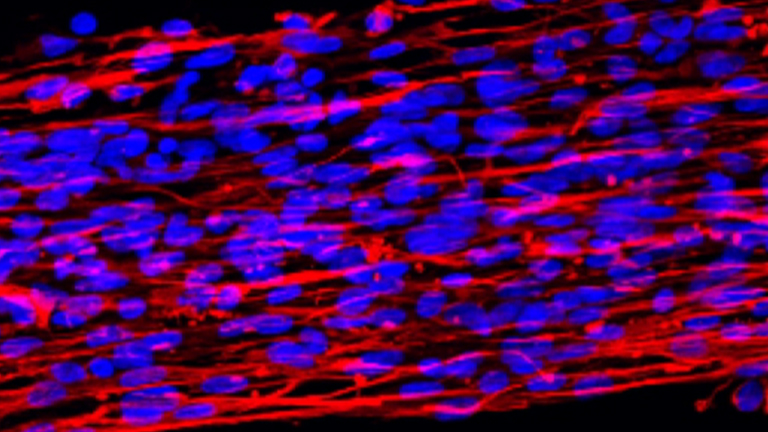 The cardiac extracellular matrix (ECM) is a complex network of molecules that orchestrate key processes in tissues and organs while enduring physiological remodeling throughout life. Standardized decellularization of fetal and adult hearts permits comparative experimental studies of both tissues in a 3D context by capturing native architecture and biomechanical properties. Silva, A. C., Oliveira, M. J., McDevitt, T. C., Barbosa, M. A., Nascimento, D. S., Pinto-do-Ó, P. Comparable Decellularization of Fetal and Adult Cardiac Tissue Explants as 3D-like Platforms for In Vitro Studies. J. Vis. Exp. (145), e56924, doi:10.3791/56924 (2019). Current knowledge of extracellular matrix (ECM)-cell communication translates to large two-dimensional (2D) in vitro culture studies where ECM components are presented as a surface coating. These culture systems constitute a simplification of the complex nature of the tissue ECM that encompasses biochemical composition, structure, and mechanical properties. To better emulate the ECM-cell communication shaping the cardiac microenvironment, we developed a protocol that allows for the decellularization of the whole fetal heart and adult left ventricle tissue explants simultaneously for comparative studies. The protocol combines the use of a hypotonic buffer, a detergent of anionic surfactant properties, and DNase treatment without any requirement for specialized skills or equipment. The application of the same decellularization strategy across tissue samples from subjects of various age is an alternative approach to perform comparative studies. The present protocol allows the identification of unique structural differences across fetal and adult cardiac ECM mesh and biological cellular responses. Furthermore, the herein methodology demonstrates a broader application being successfully applied in other tissues and species with minor adjustments, such as in human intestine biopsies and mouse lung. The extracellular matrix (ECM) is a dynamic network of molecules that regulate important cellular processes, namely fate-decision, proliferation and differentiation1,2. The investigation of cell-ECM interactions has been performed mainly in two-dimensional (2D) in vitro cultures coated with ECM components, which constitute a simplification of native ECM properties found in vivo. 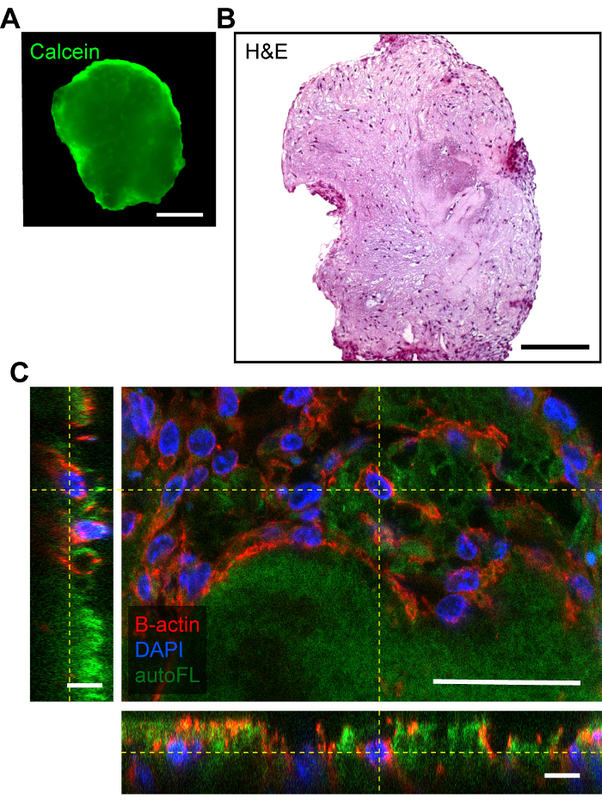 Decellularization generates acellular 3D-like ECM bioscaffolds that largely preserve the extracellular architecture and composition of native tissues and organs3,4. In addition to serving as bioactive scaffolds for tissue engineering, decellularized 3D ECM biomaterials are emerging as novel platforms to assess cell-ECM biology that parallel the in vivo environment. Assessment of the differential role of the ECM components of distinct tissues, organs and age will benefit with the use of similar protocols of generating native bioscaffolds. In the heart, we have developed a versatile protocol for decellularization of fetal and adult-derived samples, as an alternative approach to perform comparative studies of the organ microenvironment. Using this methodology, we captured the native cardiac microenvironment and showed that fetal ECM promotes higher repopulation yields of cardiac cells5. Decellularization further provided identification of resident structural differences between fetal and adult ECM at the level of basement lamina and pericellular matrix mesh arrangement and fiber composition5. Prior to this work, head-to-head comparison of tissues at different ontogenic stages using the same decellularization approach has only been reported for rhesus monkey kidneys and rodent hearts. In addition, a limited number of studies report fetal tissue/organ decellularization per se5,6,7. This has been achieved using SDS as a unique decellularization agent; however, distinct SDS concentrations were used for the decellularization of fetal and adult cardiac tissue7,8. SDS is one of the most effective ionic detergents for clearance of cytoplasmic and nuclear material, and widely used in the decellularization of different tissues and specimens9,10. Solutions containing high SDS concentrations and extended periods of exposure have been correlated with protein denaturation, glycosaminoglycan (GAGs) loss and disruption of collagen fibrils10,11, and therefore a balance between ECM preservation and cell removal is necessary. To apply the same procedure to fetal and adult heart tissue, the protocol described herein is divided in three sequential steps: cell lysis by osmotic shock (hypotonic buffer); solubilization of lipid-protein, DNA-protein and protein-protein interactions (0.2% SDS); and nuclear material removal (DNase treatment). Our protocol shows several advantages: i) the possibility of equivalent decellularization of age-specific cardiac tissues by the application of the same decellularization strategy; ii) no requirements for specialized methods or equipment; iii) ready adaptation to other tissues and species as it has been successfully applied with minor alterations in human intestine biopsies12 and mouse lung13; and, importantly, iv) can address ECM biomechanical properties while enabling the assembly of 3D-like organotypic cultures that more closely mimic the molecular features of the native tissue microenvironment. All the methodologies described were approved by the i3S Animal Ethics Committee and Direção Geral de Veterinária (DGAV) and are in accordance with the European Parliament Directive 2010/63/EU. NOTE: All decellularization solutions should be filtered through a 0.22 μm membrane filter and stored for a maximum of 3 months, except specified otherwise. For 1x PBS: Mix 8 g of NaCl, 1.01 g of Na2HPO4 200 mg of KCl, and 200 mg of KH2PO4 with 900 mL of deionized water (DI water). Adjust solution pH to 7.5 and the final solution volume up to 1 L. Filter, autoclave, and store the solution at room temperature (RT). For Hypotonic Buffer (10 mM Tris, 0.1% EDTA): Dissolve 1.21 g of TrisBASE and 1 g of EDTA in 900 mL of deionized water. Adjust solution pH to 7.8 with NaOH/HCl and the final solution volume to 1 L. Filter, sterilize by autoclave, and store at RT. For 0.2% SDS solution (0.2% SDS, 10 mM Tris): Add 0.6 g of TrisBASE and 1 g of sodium dodecyl sulfate (SDS) in 400 mL of DI water and stir at 60 °C until complete solute dissolution. Let solution to cool down to RT. Adjust solution pH to 7.8 and the final solution volume to 500 mL. Sterilize solution by filtration. NOTE: The SDS solution should be prepared prior to use. Filter solution only after complete SDS dissolution, otherwise the SDS insoluble particles will saturate the filter, changing the final SDS concentration and consequently affecting tissue decellularization efficiency. For Hypotonic Wash Buffer (10 mM Tris): Mix 1.21 g of TrisBASE in 900 mL of DI water. Adjust solution pH to 7.8 and the final volume to 1 L. Filter, sterilize by autoclave and store at RT. For DNase treatment (20 mM Tris, 2 mM MgCl2, 50 U/mL DNase): Dissolve 2.42 g of TrisBASE and 2 mL of 1 M MgCl2 in 900 mL of DI water. Adjust pH to 7.8 and the final solution volume to 1 L. Filter and sterilize solution by autoclave. Store solution at RT. Add DNase I (50 U/mL) prior to use. For DNase I stock solution: Prepare a DNase buffer containing 50% glycerol, 20 mM Tris-HCl pH 7.5, 1 mM MgCl2, and adjust to a final solution volume of 10 mL with DI water. In a laminar flow hood, add the DNase I powder to the DNase buffer and mix gently until complete dissolution. Sterilize solution through 0.22 μm filter. Prepare 1 mL aliquots and store at -20 °C. Euthanize adult pregnant females at 18 days of gestation (E18 fetuses) via CO2 asphyxiation. Perform a cesarean section on the females with a surgical scissor and collect the uterine horns bearing the fetal mice to a Petri dish with ice-cold 1x PBS using two serrated tweezers with curved tips (one tweezer to each horn end). Open the uterine horns and amniotic sac to isolate the fetuses. Transfer the fetuses to a new Petri dish with ice-cold 1x PBS to anesthetize them and decapitate with a scissor. Euthanize 7-8 weeks old male C57BL/6 mice using CO2 asphyxiation. Perform an incision on each mouse chest and collect the heart. Briefly rinse fetal and adult hearts with ice cold 1x PBS. Remove the atria of adult heart with the help of a scalpel. Perform an incision on the right ventricle and remove it using straight small scissors. Expose the left ventricle inner wall by removing the septum. In a new Petri dish, divide the left ventricle free-wall in longitudinal strips with 2 mm thickness and remove the papillary muscle using a scalpel and serrated tweezers with curved tips. Excise small tissue explants with the help of a scalpel using a 2 mm x 2 mm grid (Detailed description in supplementary Figure 15). Briefly rinse tissue explants with 1x PBS. Add ~250 µL of the optimal cutting temperature (OCT) compound to autoclaved 1.5 mL microcentrifuge tubes. Transfer whole fetal hearts and adult cardiac explants to the tubes with 250 µL of OCT and freeze them with dry ice-cooled isopentane and store at -80 °C (to a maximum of 6 months). NOTE: The use of cardiac tissue explants cryopreserved for more than 6 months will significantly reduce the decellularization efficiency, especially in the adult heart tissue explants. NOTE: Cardiac tissue decellularization is performed in a 24-well tissue culture plate with one sample per well. 1 mL of each decellularization solution is added to each individual well. All decellularization steps should be performed with agitation at 165 rpm (incubator shaker with an orbital diameter of 20 mm) and at 25 °C, unless specified otherwise. For more details, please consult the scheme on Figure 1A. Amphotericin B (e.g. fungizone) and gentamicin are freshly added to all decellularization solutions before use to a final concentration of 2.5 μg/mL and 0.01 μg/mL, respectively. 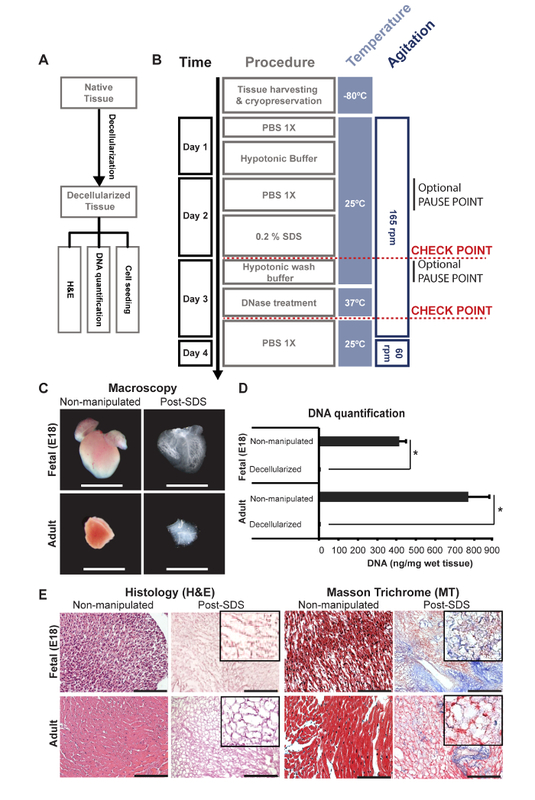 To quantify the amount of DNA retained within decellularized tissues, the sample mass needs to be determined before starting the decellularization protocol. The DNA quantification protocol is further detailed in section 5.1. Remove tissue samples from the -80 °C freezer. Leave the 1.5 mL microcentrifuge tubes at RT until OCT becomes partially melted. Transfer the cardiac tissue block of the still frozen OCT to a Petri dish with 1x PBS. After the OCT melts, move the cardiac tissue to a new Petri dish with 1x PBS. Wash samples in 1x PBS and at 60 rpm with a shaker for 10-15 min. Repeat at least twice. Add 1 mL of working Hypotonic Buffer per well of a sterile 24-well tissue culture plate.Transfer one sample per well with the help of forceps. Move the 24-well tissue culture plate with the samples to an incubator shaker at 25 °C and start the 18 h incubation with Hypotonic Buffer. Prepare the 0.2% SDS solution as described in section 1.3. Aspirate the Hypotonic Buffer and wash the samples with 1x PBS for 1 h. Repeat 3 times. NOTE: PAUSE POINT: Tissue under decellularization can be kept in 1x PBS at 4 °C for 18 h in static conditions. Remove the 1x PBS, add 1 mL of freshly made SDS solution (step 1.3) per well and incubate samples for 24 h.
NOTE: (CHECK POINT) Post SDS incubation, ensure that samples exhibit a white to translucent appearance. At this step, SDS treated samples are drenched in DNA, showing a gelatin-like consistency. Remove SDS solution slowly to avoid sample adhesion to the pipette tip. Wash the samples with Hypotonic Wash Buffer (1 mL per well) for 20 min. Repeat 3 times. NOTE: At this step, it is normal to observe a decrease in the sample size due to the removal of cell remnants. PAUSE POINT: Tissue under decellularization can be kept in Hypotonic Wash Buffer at 4 °C for 18 h in static conditions. Add 1 mL of DNase Treatment solution per well and incubate the samples for 3 h at 37 °C. Aspirate the DNase Treatment solution and wash the samples with 1x PBS (1 mL per well) for 20 min. Repeat 3 times. Perform a final wash with 1x PBS (1 mL per well) overnight at RT and shaking at 60 rpm. (Check point) After DNase treatment, ensure that the decellularized samples have lost the gelatin-like consistency. NOTE: After DNase treatment, remove and add 1x PBS gently since samples can be easily entrapped and attached to the pipette tip. Fix the samples in a 24-well tissue culture plate, 1 sample per well, by adding 1 mL of freshly made 10% formalin neutral buffer with 0.03% aqueous eosin for 2.5-3 h at RT. NOTE: Eosin is added to the fixative to stain the decellularized tissue and to ease sample visualization during sectioning and histological staining. The addition of the eosin neither interferes with the histological stains nor with immunofluorescence techniques. Alternatively, the fixation can be performed overnight at 4 °C. Remove the fixative solution and add 1 mL of 1x PBS to wash the sample. Encapsulate the fixed bioscaffolds in histology processing gel using a disposable vinyl specimen mold according to the manufacturer's instructions. Remove the histology gel with the sample embedded from the mold and transfer to Biopsy Processing/Embedding Cassettes with Lid. NOTE: An alternative to tissue embedding in histology and processing gel is to process each sample in two biopsy sponges with small pores. The samples should be localized to the center of the biopsy sponges to enable detection. Of note, some samples can be difficult to localize using this approach. Process the samples for paraffin embedding through successive incubations (30 min per solution) in series of alcohol concentrations (70%, 80%, 90%, 100%, 100%), isoparaffinic aliphatic hydrocarbon solution (2 incubation stations) and paraffin (2 incubation stations) at 56 °C. Mount the samples in a paraffin block. Cut 3 μm-thick paraffin sections on a microtome and collect the sections on glass microscope slides. Dry paraffin sections overnight at 37 °C. NOTE: (PAUSE POINT) Paraffin sections are stored at 4 °C until further use. To verify protocol efficiency, perform Hematoxilin and Eosin (H&E) and Masson's Trichrome staining (MT) of the decellularized sample sections and to sections of non-manipulated tissue according to manufacturer's instructions. NOTE: H&E staining stains cell nuclei blue/purple, cytoplasm dark pink/red and collagen pale pink and MT stains nuclei black, cytoplasm red, and collagen and mucin blue. Efficient decellularization is achieved when a porous light pink (H&E, MT) and blue (MT) network is observed, in the absence of a nuclear stain. NOTE: The quantification of the DNA content on decellularized tissue must be performed in comparison to the respective non-manipulated tissue. Decellularize the samples as described in Step 3. After decellularization, collect the decellularized tissues into a microcentrifuge tube. Due to the small dimensions and mass of the individual cardiac samples and kit specifications, pool decellularized tissues of each sample condition (fetal heart: 5 whole hearts; adult LV explants: 15 explants). Perform the same procedure with the non-manipulated tissue. NOTE: (PAUSE POINT) The samples can be stored at -20 °C until DNA extraction and quantification are performed. Cut the non-manipulated and decellularized tissues in small explants with a help of a scalpel in a clean Petri dish. NOTE: Use an individual scalpel and Petri dish for each sample. Mechanical disruption of the samples with a scalpel facilitates their posterior enzymatic digestion and subsequent DNA extraction. For DNA extraction, use a spin-column based DNA extraction method according to the manufacturer's instructions. Collect the mechanically dissociated samples from the Petri dish with the master digestion buffer (digestion buffer and proteinase K) according to the manufacturer's instructions using a wide orifice pipette tip. NOTE: Tissue lysis with Proteinase K digestion is faster in decellularized samples. To process distinct samples at the same time, keep lysed samples on ice, until all samples are lysed to minimize degradation. Complete samples lysis is achieved between 4-6 h.
Proceed with the protocol according the manufacturer instructions. To increase the yields of extracted DNA of decellularized and non-decellularized tissue samples, elute the DNA on 25-50 μL and 100 μL of elution buffer, respectively. Collect the eluted DNA and load the spin-column. Incubate for 1 min at RT. Centrifuge the samples according to the manufacturer's instructions. NOTE: (PAUSE POINT) The DNA extracted from the samples can be store at -20 °C until further use. Quantify the extracted DNA from the samples with a fluorescent dsDNA detection kit following the manufacturer's instructions. Normalize the DNA content as nanograms of DNA per milligram of initial sample wet weight (before decellularization). NOTE: All solutions/reagents need to be sterile and the entire procedure performed at sterile conditions. Prepare 1x DPBS with 2.5 μg/mL of amphotericin B and 1% P/S (penicillin, 100 I.U. ; streptomycin 100 µg/mL). Remove the 1x PBS solution from the last decellularization washing step (step 3.3.3) and add 500 μL per well of the freshly prepared 1x DPBS/2.5 μg/mL of amphotericin B/1% P/S solution. Store samples at 4 °C from 1-7 days. NOTE: Samples storage at 4 °C is important to maintain sterility. Add P/S to cell basal media (without FBS and supplements) to a final concentration of 1%. Aspirate 1x DPBS/2.5 μg/mL of amphotericin B/1% P/S solution from the decellularized samples. Add 500 μL per well of cell basal media/1% P/S and let samples equilibrate for 1 h at 37 °C, or at 4 °C for more than 1 h.
Split the cells of interest and prepare small aliquots of cells at the cell density desired. NOTE: The decellularized tissue seeding must be performed under a stereoscopic microscope and in sterile conditions. Cell culture media should contain 1% P/S. Pipette 3-4 μL of DPBS to the center of a well of a 96-well plate. Using thin and straight tweezers, transfer the decellularized scaffolds to the DPBS drop, remove the extra DPBS by aspiration, and make sure that the sample is not folded or wrinkled. Let it become dry at the edges to adhere to the well surface. NOTE: Detached scaffolds have lower seeding efficiency. Add cells to the scaffold by pipetting the single-cell solution slowly against the edges of the well. NOTE: For example, neonatal rat cardiomyocytes are seeded with at a density of 7,500 cells/mm2 and immortalized mouse Lin− Sca-1+ cardiac progenitor cells (iCPCSca-1) at a density of 60-1,500 cells/mm2. Adjust cell density according the experimental rationale. Add DPBS to the neighboring wells to avoid fast media evaporation. 24 hours post cell seeding, if the cell type used adhered to the tissue culture polystyrene plates (TCPS), transfer bioscaffolds to a new well. Otherwise, replace the medium to remove non-adherent cells. Change carefully the media according to specific requirements of the cell type. The decellularization efficiency should be assessed through three main techniques: macroscopic observation, histology and DNA quantification. The macroscopic appearance of samples post-SDS treatment indirectly affects the efficacy of cell removal. After SDS incubation, samples should appear as translucent to whitish (Figure 1C). Fetal (E18) decellularized tissues are characterized by a highly translucent structure while adult explants have a translucent to white appearance. A whiter appearance is generally correlated to an ECM network exhibiting higher fiber and collagen content, e.g. the adult ventricular and vascular vessels ECM mesh (Figure 1C). Hematoxylin & Eosin (H&E) and/or Masson's Trichrome (MT) stains are performed to confirm efficient cell removal by the observation of a porous mesh (light pink, H&E; light pink and blue, MT) (Figure 1C). In addition, the MT stain highlights the collagen meshwork in blue5. Clearance of nuclear material after decellularization is accessed by DNA quantification and a reduction of approximately 99.8% is generally obtained, when compared to non-manipulated tissues (Figure 1C). The presence of nuclear material on decellularized scaffolds has been described as a trigger of undesired inflammatory response upon implantation14. For this reason, confirmation of efficient decellularization is essential prior to native 3D scaffold repopulation experiments. Decellularized scaffolds may be stored in sterile conditions up to the seeding with the cells of interest. Cell viability is monitored throughout in vitro culture by calcein staining (Figure 2A). Nevertheless, calcein stain can be cytotoxic to sensitive cell types. Terminal analysis of cell repopulation and distribution across scaffolds is performed post-paraffin processing; a snapshot of the bioscaffold repopulation assessed by H&E staining at a central section of bioscaffolds is shown (Figure 2B, 2C). Figure 1. Fetal (E18) and adult cardiac tissue decellularization procedure and confirmation of decellularization efficiency. (A) Protocol overview. (B) Decellularization protocol detailed. (C) Macroscopic analysis of cardiac fetal and adult tissue before and after decellularization. Scale bar: 2 mm. (D) Quantification of nuclear material in decellularized versus non-manipulated tissue. Data expressed as mean ± SEM. Student's t-test, two-tailed *p<0.05. (E) H&E and Masson's Trichrome histological analysis of cardiac fetal and adult tissue before and after decellularization. Scale bar: 100 μm. Please click here to view a larger version of this figure. Figure 2. Repopulation analysis of decellularized scaffolds seeded with Lin- Sca-1+ cardiac progenitor cell line (iCPCSca-1). (A) High cell viability observed at scaffolds surface during in vitro culture by calcein stain (green). Scale bar: 100 μm. (B) Cell number and distribution across scaffolds assessed via H&E staining. Scale bar: 100 μm. (C) Orthogonal view of cells embedded in the decellularized ECM. Confocal image of 50μm-thick paraffin section. Scale bar: 10 μm (orthogonal view XZ, YZ) and 40 μm. Please click here to view a larger version of this figure. 3.2.4. Pink-to-white opaque samples SDS solution was not well prepared; adult LV explants too big Inefficient removal of cytoplasmic proteins Ensure complete SDS dissolution. Decellularize samples of smaller size. 3.3.4. Samples with a gelatin-like appearance Inefficient DNA removal Inefficient nuclear material clearance Increase DNase concentration and/or incubation time. Table 1. Troubleshooting table for parallel decellularization of fetal (E18) and adult mouse cardiac tissue. The extracellular matrix (ECM) is a highly dynamic and complex meshwork of fibrous and adhesive glycoproteins, consisting of a reservoir of numerous bioactive peptides and entrapped growth factors. As the major modulator of cell adhesion, cytoskeleton dynamics, motility/migration, proliferation, differentiation and apoptosis, ECM actively regulates cellular function and behavior. Knowing that cellular behavior differs in 2D and 3D cultures, there have been efforts to develop novel organotypic models that can accurately replicate natural tissue environments. In the last years, tissue decellularization has emerged as an alternative technique for tissue engineering and regenerative medicine. Thus, tissue and organ decellularization is currently the tool of choice to better dissect tissue-specific microenvironmental parameters (biochemical, structural and mechanical) and biological activity in vitro and in vivo. We developed a protocol that combines the use of a hypotonic buffer with a detergent of anionic surfactant properties followed by a DNase treatment5,12,13. The present protocol constitutes a simple and reproducible method to perform comparative analysis between decellularized fetal and adult mouse cardiac tissue. Our experience with other tissues, namely with tumor samples derived from cancer patients' surgical resections and mouse lung tissue, shows that this protocol is easily adaptable and successful in other conditions and models12,13. The application of the same decellularization procedure on different samples allows comparative studies of the ECM composition, biomechanical properties, architecture and cellular modulatory properties in a 3D context. One of the most difficult challenges of tissue decellularization is the balance between outright cell removal, ECM meshwork preservation and tissue biocompatibility. Hence, several critical steps need to be carefully considered, such as the time of tissue cryopreservation before decellularization, the correct explant size, the use of fresh solutions, and the manipulation of the final decellularized tissue. During our studies, we observed a direct correlation between long storage time of cryopreserved tissue and the use of longstanding SDS solutions with decellularization inefficiency. Long term tissue storage leads to inefficient cellular content removal rendering remnants of thick cellular areas (without nuclei) among the complex ECM meshwork. A similar undesirable effect is attained when long stored SDS solutions are used for tissue decellularization, likely because SDS solutions have a short stability due to reduced solubility, hydrolysis, and pH alterations over time15,16. The use of explants of the correct size (~1.5 mm x 1.5 mm x 1.5 mm) is also essential for successful adult tissue decellularization, since larger tissue resections are more difficult to decellularize, displaying cell debris entrapped at the surface and arrested between the dense ECM network. Although this protocol provides an efficient method of cardiac tissue decellularization, a minor fraction of adult explants may present cell remnants, in particular those of a larger size. Histological analysis of these samples eases their identification and subsequent exclusion from the study. Ultimately, the protocol herein is versatile and readily applicable to distinct specimens with slight adjustments to the tissue explant size, SDS concentration (0.1-0.2% SDS) or solution incubation time5,12,13. The major limitation of the present method is that the manipulation of small size samples, i.e. murine fetal heart and adult heart explants, requires some handling skills. In fact, both fetal and adult decellularized tissues are delicate structures that can be permanently deformed when dried during the procedure or entrapped by the thin pipette tip or during handling with forceps5. The major novelty of this protocol, besides the parallel decellularization of fetal mouse heart and adult left ventricle explants for comparative assessment of the ECM composition (biomechanical analyses) and associated biological function, is its simple translation to distinct tissues and models5,12,13. The decellularization of tissues of distinct ages by applying standardized methodology was described only on the rhesus monkey kidney, and the transverse sections of fetal, neonatal and adult tissues, which were subjected to a 1% SDS treatment for 10 days6. In a cardiac setting, although fetal, neonatal and adult tissues have been decellularized, the methods differed on the degree of mechanical dislodging, SDS concentrations and time of application7,8. As each decellularization procedure affects the ECM in a unique manner, the comparison of decellularized samples obtained from different protocols may lead to misleading conclusions. Hence, applying the same decellularization procedure across different samples enables reliable comparative analysis. The large majority of the commercially available decellularized tissues derive from adult specimens17. Despite the growing recognition for an increased ability of fetal microenvironments in providing pro-regenerative signals in comparison to their adult counterparts, decellularization of fetal tissues was only reported in few studies5,7,18,19,20,21. Understanding ECM dynamics during the aging process will be crucial to identify unique features of pro-regenerative microenvironments which, in turn, will impact the development of higher efficiency biomimetic-materials. The authors are indebted to all members of Pinto-do-Ó laboratory for relevant critical discussion. This work was supported by Programa MIT-Fundação para Ciência e Tecnologia (FCT) under the project "CARDIOSTEM-Engineered cardiac tissues and stem cell-based therapies for cardiovascular applications" (MITP-TB/ECE/0013/2013). A.C.S. is a recipient of a FCT fellowship [SFRH/BD/88780/2012] and M.J.O. is a FCT Fellow (FCT-Investigator 2012). Frantz, C., Stewart, K. M., Weaver, V. M. The extracellular matrix at a glance. Journal of Cell Science. 123, (24), 4195-4200 (2010). Rozario, T., DeSimone, D. W. The extracellular matrix in development and morphogenesis: a dynamic view. Dev Biol. 341, (1), 126-140 (2010). Badylak, S. F., Taylor, D., Uygun, K. Whole-Organ Tissue Engineering: Decellularization and Recellularization of Three-Dimensional Matrix Scaffolds. Annu Rev Biomed Eng. 13, (1), 27-53 (2011). Ott, H. C., et al. Perfusion-decellularized matrix: using nature's platform to engineer a bioartificial heart. Nat Med. 14, (2), 213-221 (2008). Silva, A. C., et al. Three-dimensional scaffolds of fetal decellularized hearts exhibit enhanced potential to support cardiac cells in comparison to the adult. Biomaterials. 104, 52-64 (2016). Nakayama, K. H., Batchelder, C. A., Lee, C. I., Tarantal, A. F. Decellularized rhesus monkey kidney as a three-dimensional scaffold for renal tissue engineering. Tissue Eng Part A. 16, (7), 2207-2216 (2010). Williams, C., Quinn, K. P., Georgakoudi, I., Black, L. D. 3rd Young developmental age cardiac extracellular matrix promotes the expansion of neonatal cardiomyocytes in vitro. Acta Biomater. 10, (1), 194-204 (2014). Fong, A. H., et al. Three-Dimensional Adult Cardiac Extracellular Matrix Promotes Maturation of Human Induced Pluripotent Stem Cell-Derived Cardiomyocytes. Tissue Eng Part A. 22, (15-16), 1016-1025 (2016). Tapias, L. F., Ott, H. C. Decellularized scaffolds as a platform for bioengineered organs. Curr Opin Organ Transplant. 19, (2), 145-152 (2014). Crapo, P. M., Gilbert, T. W., Badylak, S. F. An overview of tissue and whole organ decellularization processes. Biomaterials. 32, (12), 3233-3243 (2011). Gilbert, T. W., Sellaro, T. L., Badylak, S. F. Decellularization of tissues and organs. Biomaterials. 27, (19), 3675-3683 (2006). Pinto, M. L., et al. Decellularized human colorectal cancer matrices polarize macrophages towards an anti-inflammatory phenotype promoting cancer cell invasion via CCL18. Biomaterials. 124, 211-224 (2017). Garlikova, Z., et al. Generation of a close-to-native in vitro system to study lung cells-ECM crosstalk. Tissue Eng Part C: Methods. (2017). Wong, M. L., Griffiths, L. G. Immunogenicity in xenogeneic scaffold generation: Antigen removal vs. decellularization. Acta Biomaterialia. 10, (5), 1806-1816 (2014). Motsavage, V. A., Kostenbauder, H. B. The influence of the state of aggregation on the specific acid-catalyzed hydrolysis of sodium dodecyl sulfate. J Colloid Sci. 18, (7), 603-615 (1963). Rahman, A., Brown, C. W. Effect of pH on the critical micelle concentration of sodium dodecyl sulphate. J Appl Polymer Sci. 28, (4), 1331-1334 (1983). Brown, B. N., Badylak, S. F. Extracellular matrix as an inductive scaffold for functional tissue reconstruction. Transl Res. 163, (4), 268-285 (2014). Ieda, M., et al. Cardiac fibroblasts regulate myocardial proliferation through beta1 integrin signaling. Dev Cell. 16, (2), 233-244 (2009). Whitby, D. J., Ferguson, M. W. The extracellular matrix of lip wounds in fetal, neonatal and adult mice. Development. 112, (2), 651-668 (1991). Brennan, E. P., Tang, X. H., Stewart-Akers, A. M., Gudas, L. J., Badylak, S. F. Chemoattractant activity of degradation products of fetal and adult skin extracellular matrix for keratinocyte progenitor cells. J Tissue Eng Regen Med. 2, (8), 491-498 (2008). Coolen, N. A., Schouten, K. C., Middelkoop, E., Ulrich, M. M. Comparison between human fetal and adult skin. Arch Dermatol Res. 302, (1), 47-55 (2010).